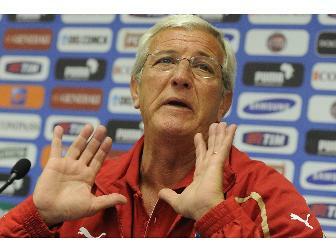 Marcello Lippi will lead the Lega Pro side against Palestine. Jamal Mahmoud will lead Palestine for the third time in an unofficial friendly ahead of next month's Pan-Arab Games. This time the opponent will be the Lega Pro Select team that the Olympic team defeated 3-0 in June. Jamal Mahmoud has given a lifeline to Ali El-Khatib who was handed a yearlong suspension by Hilal Al-Quds for alleged match fixing. Mahmoud was in charge of Hilal Al-Quds when that suspension was doled out- so this development is bizarre, to say the least. This game will give an opportunity to some of the Olympic Team players to win a spot on the senior team. Jamal Mahmoud's inclusion of senior team players should give an idea of how they will mesh with the current setup. Perhaps the most impressive thing about them is that they will be lead by Marcello Lippi- Yes, the same guy who managed Italy to World Cup glory in 2006 and World Cup ignominy in 2010. The squad will be made up of the most promising young players in Italy's third division. Only Walter Zullo was part of the squad that lost 3-0 to Palestine in Dora. The will be overseen by an all-female crew of referees led by Silvia Tea Spinelli. The national team has been kitted out- puffy jackets and all- by Legea. The jersey unveiled at the press conference looked like an Atletico de Madrid or Red Star Belgrade shirt with prominent red and white stripes. BAVENA Andrea 3/4/1990 Calcio Portogruaro Summaga S.r.l. GIORDANO Daniele 3/4/1991 A.C. Perugia Calcio S.r.l. D’AGOSTINO Giovanni 8/23/1991 U.S. Vibonese Calcio S.r.l. MASI Alberto 9/2/1992 F.C. Pro Vercelli 1892 S.r.l. MECCARIELLO Biagio 3/27/1991 A.S. Andria Bat S.r.l. PRIOLA Giusto 5/26/1990 Trapani Calcio S.r.l. SIGNORINI Andrea 1/31/1990 Benevento Calcio S.p.A.
ZULLO Walter 5/3/1990 Calcio Como S.r.l. BIGONI Marco 12/3/1990 S.S. Chieti Calcio S.r.l. CARRETTA Mirko 11/23/1990 Benevento Calcio S.p.A.
COPPOLA Mario 8/7/1990 Calcio Portogruaro Summaga S.r.l. FARONI Alessandro 1/3/1991 A.C. Lumezzane S.p.A.
MANZO Stefano 2/2/1990 U.S. Gavorrano S.r.l. SICILIANO Pasquale 5/5/1991 Paganese Calcio 1926 S.r.l. CAIRA Gianmarco 4/4/1991 A.C. Isola Liri S.r.l. FISCHNALLER Manuel 7/20/1991 Fussballclub Sudtirol S.r.l. PACI Tommaso 6/16/1991 A.C. Giacomense S.r.l. SPAGNA Stefano 1/18/1991 A.S. Melfi S.r.l.